TeamBonding partners with local children’s organizations (such as Big Brothers Big Sisters, Boys and Girls Clubs, etc. ), wherever your event takes place, to offer this charitable team building event. This activity will contribute a memorable gift to children who would otherwise never have the joy you experienced while riding your first bicycle. 25 square feet of open space per participant is a good guideline. The Charity Bike Build can be indoors or outdoors – your office building, a ballroom or a conference room. IT’S THE BEST TEAM BUILDING PROGRAM YOU WILL EVER EXPERIENCE! Take your corporate and social responsibility initiatives to the next level! Get your team in gear, armed with wrenches and enthusiasm as they race to build the ultimate human-powered, no-gasoline-needed rockets: children’s bicycles! For more than 12 years we have helped hundreds of companies just like yours build and donate more than 18,000 children’s bicycles and counting, around the world. It’s our favorite program, bar none. Do you remember getting your very first bicycle, maybe as a birthday or Christmas present? Summers were spent riding bikes around the neighborhood with friends and family. So many children never get to experience this cherished pastime. That’s where you come in! For most of the children involved, typically ages 6-9, the bikes you build will be their first one ever! The charity bike build program is powerful from the outset and engages people immediately in a way that they have never experienced before! Purpose allows people to work harder and with more passion than if the work were just for themselves. Work inter-dependently working with everyone on your team every step of the way. Often we are able to coordinate children on site to accept the bikes. The smiles, the tears, the perfect team building event! New Option for 2019: Green Machines! Get ready for spin action with the Huffy 20″ Green Machine, which features a durable steel frame with stylish black and lime green accents and dual-stick steering for awesome 180-degree spins! Ask your Account Manager about building Green Machines or adding them to your Charity Bike Build today. I just wanted to thank you for your assistance with the bike build. The build went off without a hitch, the teams were really into the competition not knowing that the kids would be showing up later in the day. Once the kids arrived, it was just awesome and our folks loved it. Our Charity Bike Build donation event was a huge success. Matt and his team handled everything beautifully, and our group had a ton of fun. I heard nothing but positive comments afterwards. One comment today was ‘after working here for 12 years and participating in many team building events, this one is at the top of my list.’ Seeing the kids receive the bikes was huge! We will definitely recommend you to our colleagues. Thank you, Thank you, Thank you! I had my bike building/team building event yesterday. Our event was FANTASTIC!! 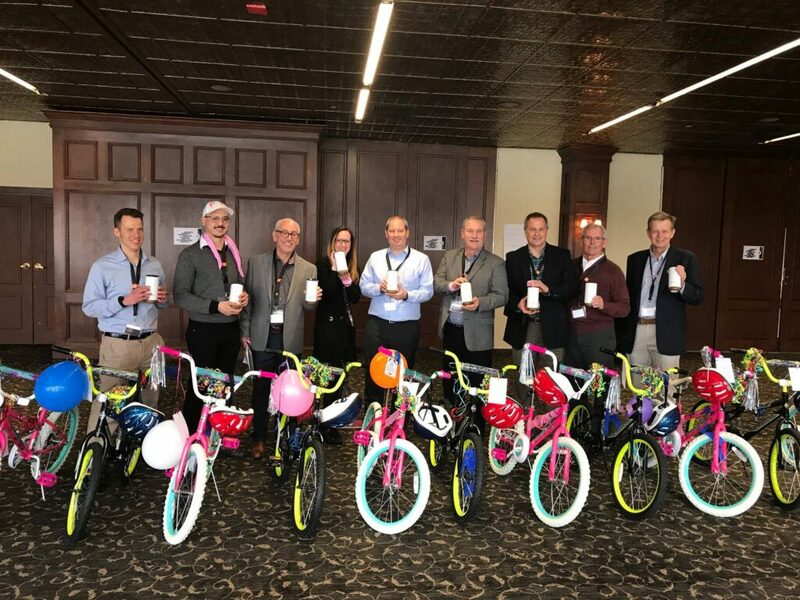 My team enjoyed themselves and we were able to surprise them with the children receiving the bikes at the end that just brought home our efforts in such a phenomenal way. Sheryl and team were a pleasure to work with! I am shouting from the roof top this morning about your company and recommending you to everyone I know. Thank you again! Charity bike build event facilitated by TeamBonding was a great way to cap off a professional development day. From start to finish, TeamBonding's communication and handling of all logistics that allowed for a seamless event experience. Jayne and her team where great and participant feedback was positive. Thank you! Had a great time doing the Charity Bike Build Event - Kevin and his team were super - professional and efficient and made sure all details were covered. TeamBonding was super easy to work with and provided us with a great event for our employees. The event was a lot of fun and engaging and really brought our team together. The facilitators were great and kept everything running smoothly. The team thoroughly enjoyed the event and it was even better that we got to complete an event for charity and help the community. Great event by a great team and we will definitely reach out again for future team building events. This year (our third with Teambonding) we did the charity bike build. Our facilitators were excellent (Christian, Olivia, Tommy) and our team of 62 had a fantastic morning. There was a nice blend of cerebral and physical challenges, and it really served to create opportunities for real collaboration. This activity was the culmination of a few days of working together (we have teams on both coasts) and I have already recommended it to others. I heard from the lead Client that everyone enjoyed the activity, and were grateful it was for a local charity.